A $5,000 dollar bill sounds outrageous. Can you imagine walking around with a single bill that could buy a used car? What if you lose it? Now that would be a bad day. You may think that I’m joking about a five thousand dollar bill, but keep reading and you’ll find out that it’s very real. Is there a $5,000 dollar bill? Yes, a $5,000 dollar bill does exist, and while they’re very rare nowadays, they’re still considered legal tender. When I said rare, I meant it. It is thought that no more than 342 $5,000 dollar notes have escaped destruction. Most of these are now in the hands of museums and private collectors. Who is on the $5,000 dollar bill? James Madison is on the $5,000 dollar bill. He is a Founding Father and the 4th President of the United States. As you can see, the backside of the bill is pretty interesting too. It depicts George Washington resigning his commission as commander-in-chief. How much is a $5,000 worth? As I mentioned earlier, there are only about 342 $5,000 dollar bills still around. Which means they’re worth much more than their printed value. Even a $5,000 dollar bill in poor condition can fetch upwards of $30,000. A bill in pristine condition could fetch 2 or 3 times that amount. Where can you buy a $5,000 dollar bill? You won’t find a $5,000 dollar bill at your local pawn shop. These bills are almost only available at auctions or through private dealers. Your best bet is to find a professional currency dealer/collector who will be able to put you in touch with someone willing to sell their $5,000 dollar bill. Why aren’t high denomination bills used anymore? 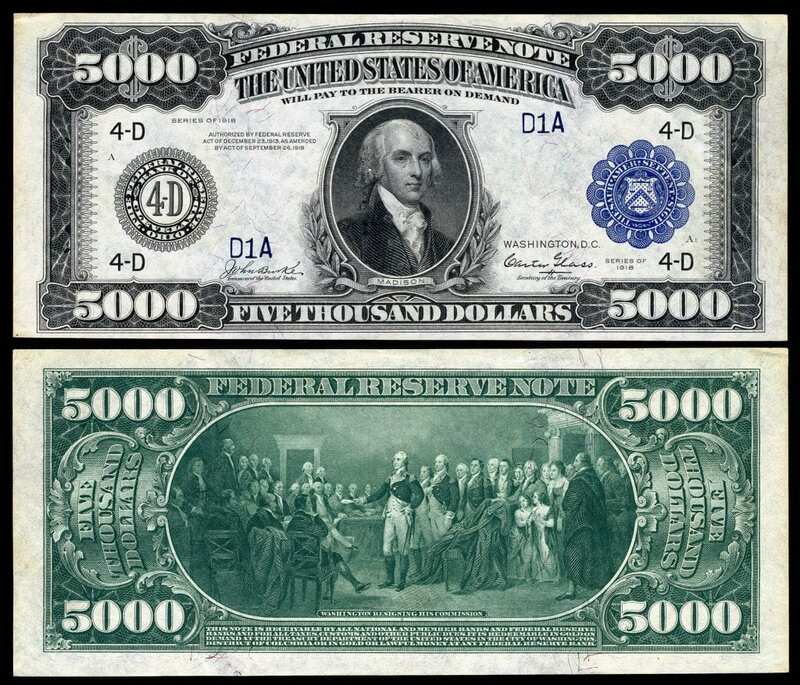 While they’re still legal tender, high-denomination bills like the $5,000 dollar bill were last printed in 1945. Then, in 1969 the Federal Reserve officially discontinued them due to “lack of use”. Originally the purpose of high denomination bills was to help banks and the federal government make large transactions. With the introduction of the electronic money system, the use of the bills disappeared. Along with the higher potential for counterfeiting and use for illegal activities, it’s very unlikely that high-denomination bills are ever going to come back into circulation. Yes, a $5,000 dollar bill exists and is still technically considered legal tender. It’s now worth much more than five thousand dollars because of how rare the note is. It’s valued at upwards of $30,000 depending on condition. James Madison adorns the $5,000 dollar bill. Its original purpose was to help facilitate large transactions between banks and federal institutions. Did you know there’s also a $500 dollar bill, a $1,000 dollar bill, a $10,000 dollar bill, and even a $100,000 dollar bill?